For the past 2 years I have watched a valiant curved bill thrasher in my yard. Big deal, right? Well, for this intrepid feathered survivor it is. I started watching it as it visits my feeder, after all of the others greedy little feeders leave for other pickings. This guy is definitely different and its mate appears to be a solid supporter…a true friend. The two of them approach and go for the ‘spillings’ left by the feeding frenzy of the first serving. For a while I couldn’t figure out what was going on as my little hero skulked in the underbrush with an occasional quick visit to the fountain. It was at that point that I realized that the left leg stuck out like a ski pole at a direct right angle from its body. Now, the issue isn’t that he doesn’t have two good legs to stand on. The disadvantage of having this extra encumbrance jutting out of the side of an otherwise streamlined body is just inconsistent with the gestalt of the bird as well as creating a dangerous situation as it goes through the day. I have watched it fly with the sticking out leg. I have watched it perch with the sticking out let. I have watched it feed with the sticking out leg….and I have wondered exactly what happened to it. I guess I will never know, but it just acts like it was always that way and no big deal! OK?! I have extrapolated from this that our rehabilitation works! I have in the past worried that maybe these animals that have run into trouble at all stages of their lives, might not have the stuff that it takes to survive. 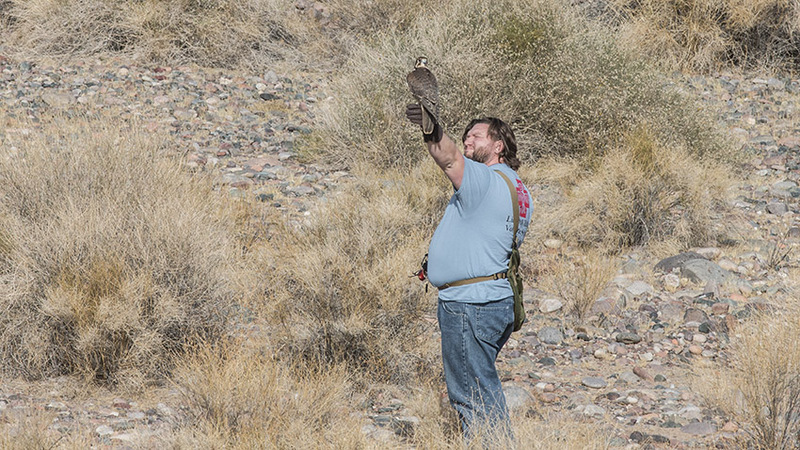 Maybe they aren’t able to adapt to the trials and tribulations that nature hurls at them…even with our help. But, not any more. This little feathered fury and the mate seemed to have taken adversity and run with it….and in your face, Mother Nature, you can’t take us down! They are the dynamic duo in my yard, and I cherish every day that I see them. They have learned how to survive, together even if the left leg provides a challenge every second. I feel better now about every one of the almost 8000 animals that we worked with just last year. I feel like they got the boost that they needed either from the beginning of their lives or from any stage that the tough cards were dealt. All it takes is a little help from your friends….and those might just be your friends at Liberty Wildlife…just a little help from your friends…then in your face Mother Nature…We will survive! The intake total for this year is now up to 80. 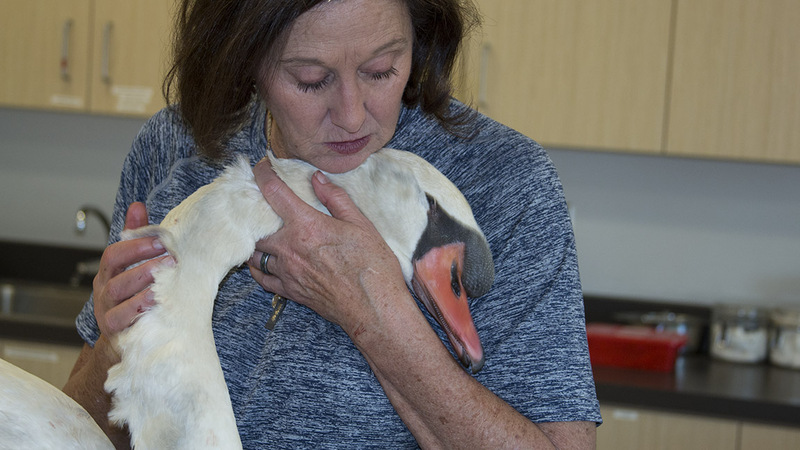 The new year is starting off slowly as it always does, but we’re still here, still taking in injured and orphaned animals, and still providing the best care possible. We actually got some rain last week, the first real measurable precipitation in many months and we’re hoping the rain gods smile on us and we get more before the temps begin to rise again. Additions/improvements are continuous at the new facility. 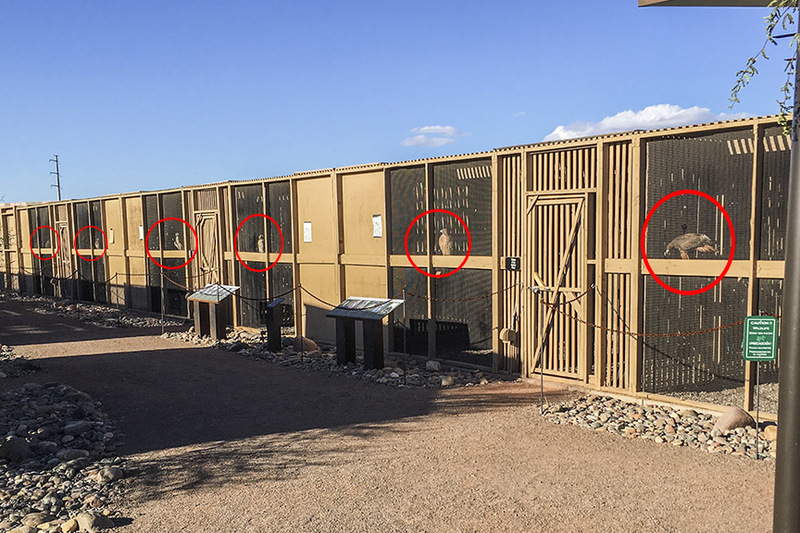 Recently I noticed a face in every enclosure as I looked down the lane in front of the hawk pavilion. You won’t see THAT when you visit the zoo! 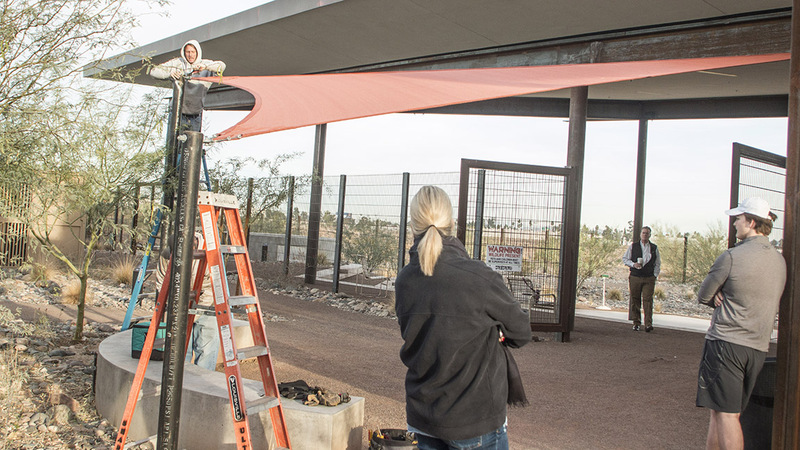 Then, the sunshade was installed over the eagle feeding station in preparation for next summer.The public will get to see eagles being hand fed up-close and personal and not bake in the sun while the birds are fed. “Tesla” is an amazing bird! 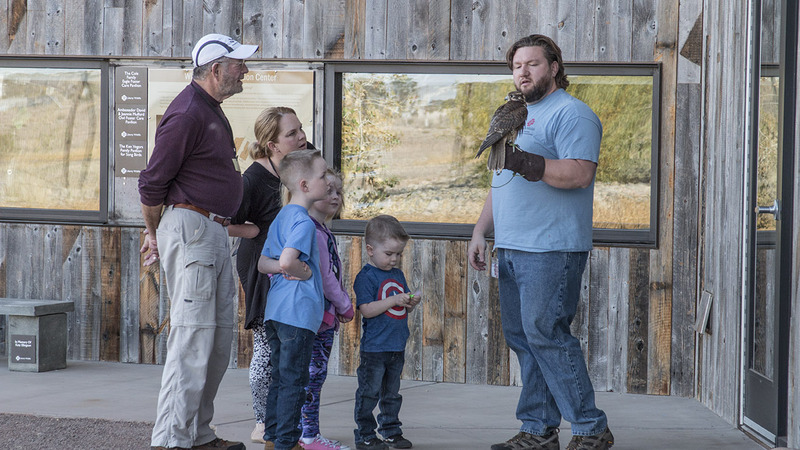 Dan Scrivener, Medical Service and Education volunteer, is an accomplished falconer. 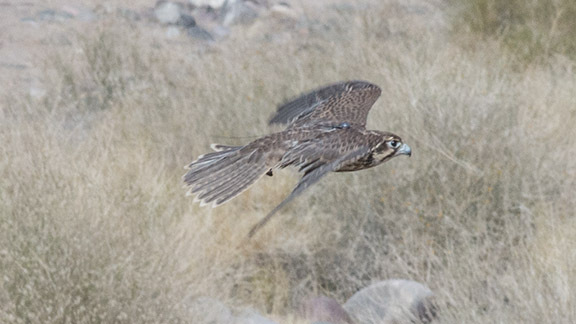 Recently he flew one of his birds, a prairie falcon named “Tesla,” in the river bed north of our facility. The demonstration was impressive as anytime you get to see one of these falcons fly in person, it’s an edifying experience! 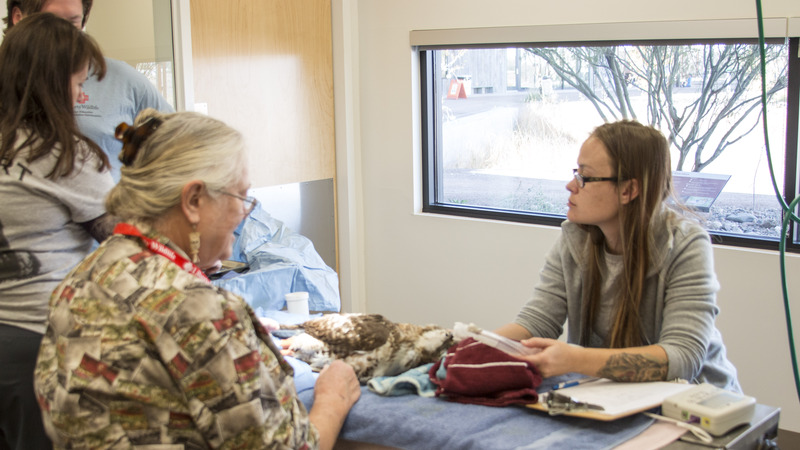 A hawk was brought to us recently with an injured toe. It was determined that the digit needed to be amputated so Dr. Orr performed the surgery, assisted by Jan and Alex. 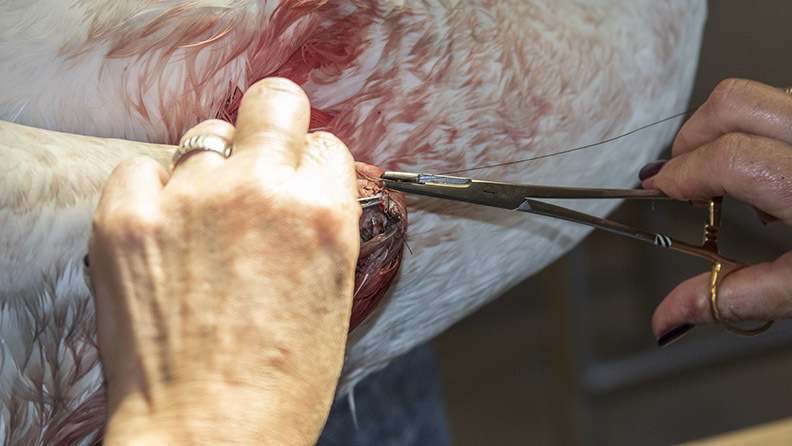 Although birds such as hawks use their feet and toes to capture and kill their prey, the loss of one toe is usually not a severe handicap for an experienced raptor as long as it’s not the hallux, or rear toe that is lost. 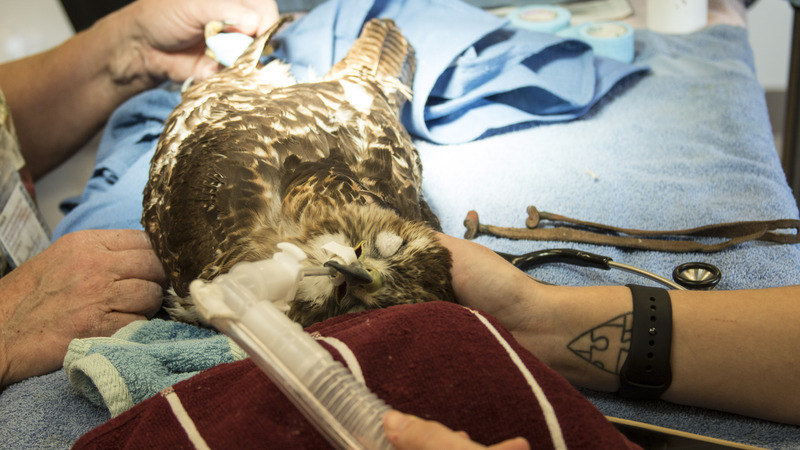 Most birds can easily adapt to this condition and it’s expected that this hawk will make a full recovery. 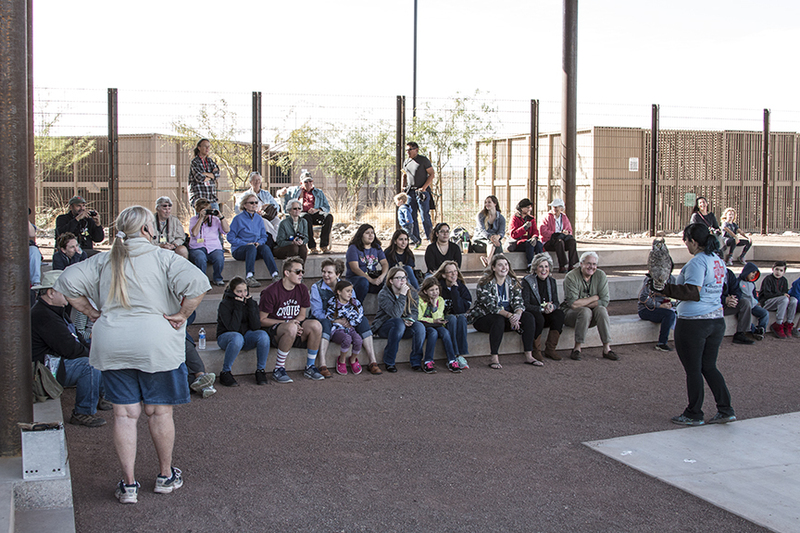 It is truly a wonderful thing to have our amphitheater available for education events. 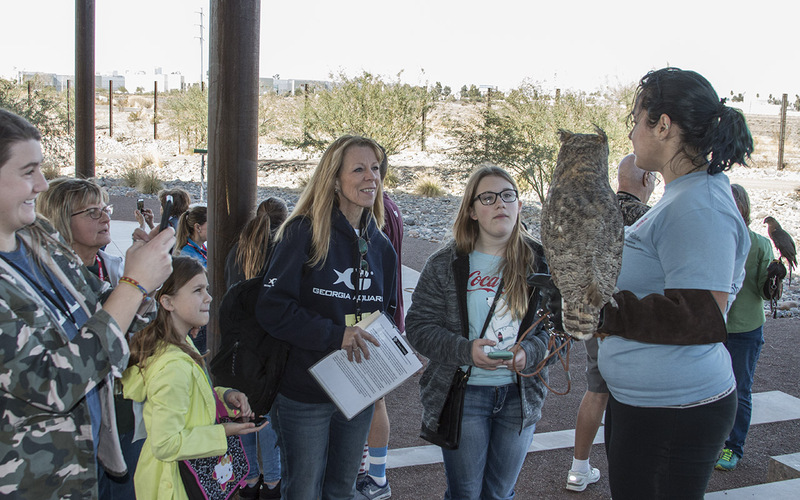 In the past, we’d have to take all education animals out to locations off site in order to present our ambassador to the public. 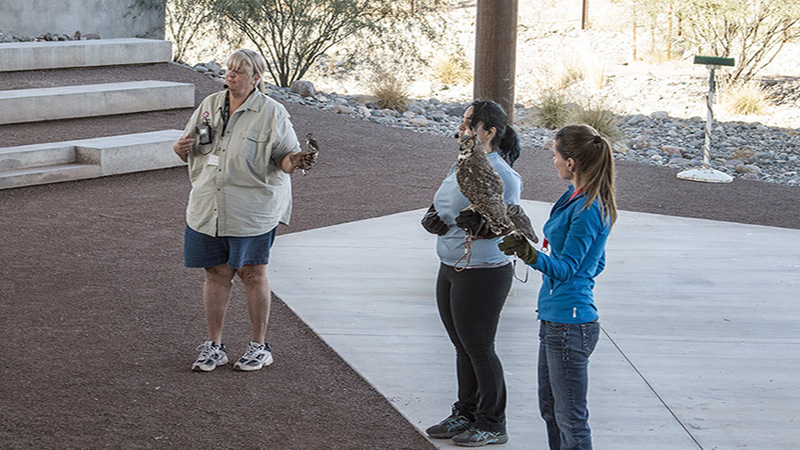 Now at the new facility, the public can come to us for a first hand look at their native wildlife and learn just how fascinating and beautiful our local fauna really are! 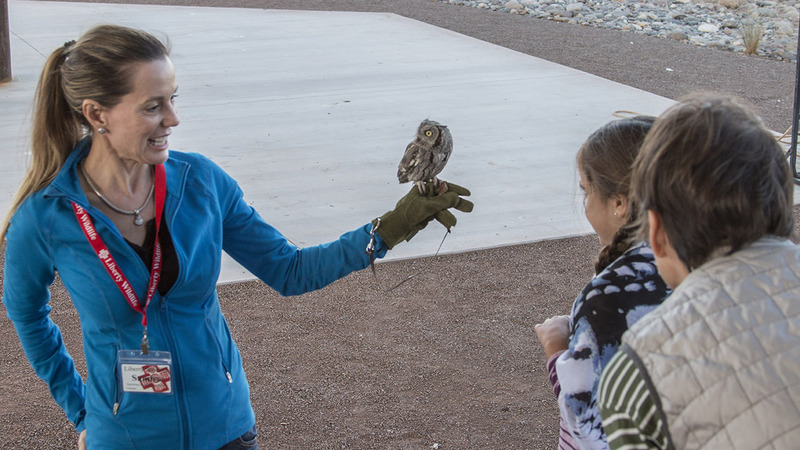 Photography is available and encouraged, and when you’re looking at an animal and it’s looking back at you, it’s difficult not to make a visceral connection – the whole point of what we do in Education! 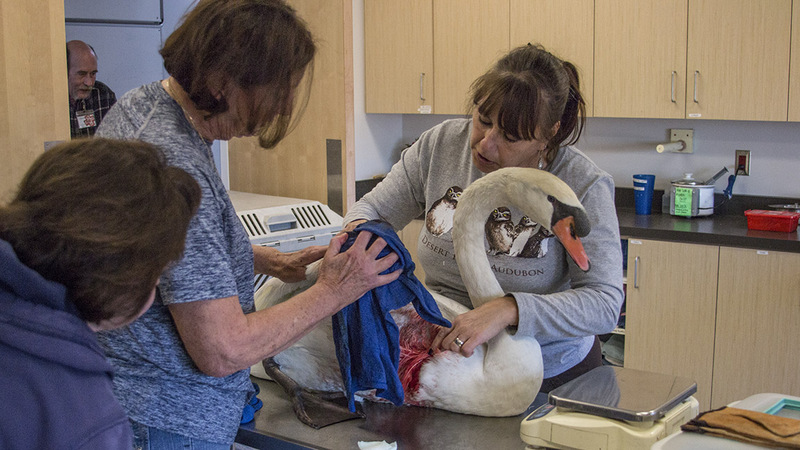 Ace rescue volunteer Carl Price bought in an injured swan several days ago. 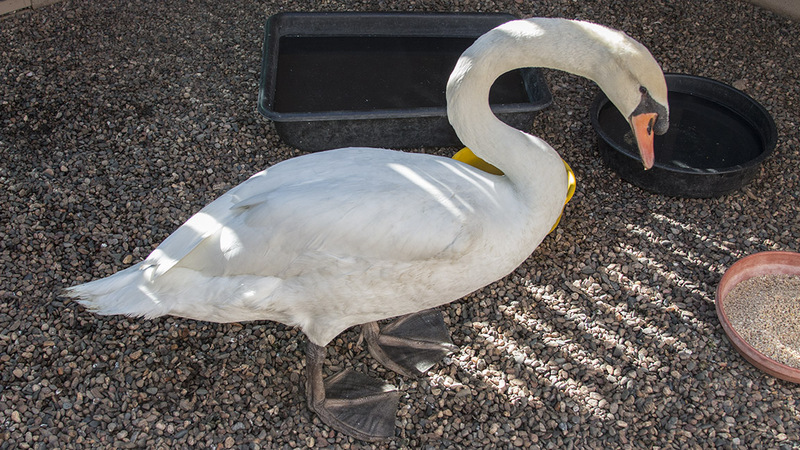 It seems the bird had been hit by a car as it wandered the streets in search of it’s deceased mate (swans are believed to mate for life). The bird’s right wing was damaged but the injury did not appear life-threatening although it looked somewhat grim upon arrival. 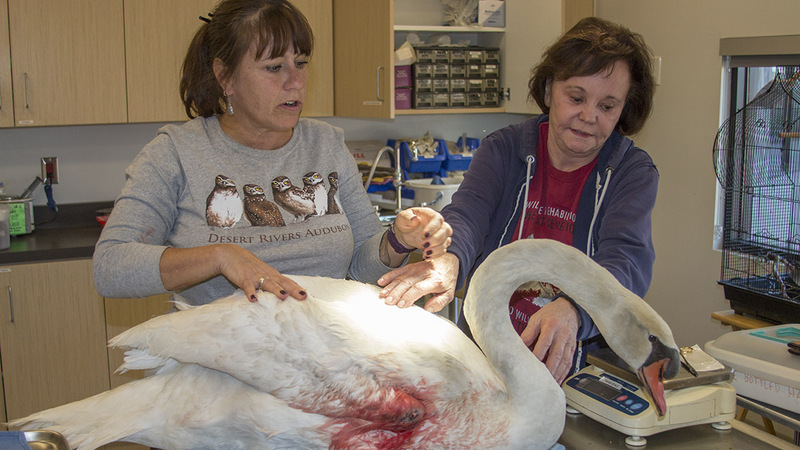 After being assessed by Jan with the help of Joanie and Sharon, the injured tissue was sutured shut and the bird was allowed to get some stress relief in a larger enclosure. At this time she is recuperating outside and will soon be transported to a permanent home nearby.